We make the whole event a comfortable experience and capture in a way that you have memories to cherish for a lifetime. It's been 13 years since CRYSTAL PHOTO STUDIO came into light. Proprietor of studio, Arul Dsouza, has been successful in making several events special. 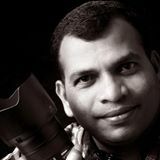 Arul being passionate of videography and photography since childhood, started his career as videographer in the early 1990's at a very young age. He then developed his interest as an event decorator and made it as part of his business. Few years later, he took a step ahead from videography, embraced photography and put up his studio in Shirva on 18th August 2004. Being successful as a photographer, videographer & decorator over the years, Arul is also excelling as an event manager by organising the whole event, be it of any kind. He has a team of talented and experienced artists who highlight their personality with the touch of their professionalism. They create a wonderful pictorial chronology of your big day and capture the significant moments preserving the spirit of celebration. Time never waits and it goes on.. But CRYSTAL crew can freeze the moment, capture and frame it for you to cherish it lifelong. They are best in translating the raw images into the ones that you would not like to take your eyes off. Capture the essence of your moment and your spirit. CRYSTAL crew will record your special day and turn it into a breathtaking video for you to replay it lifelong. We give a reason to cherish the highlights of the event along with the whole coverage of the occasion. An event is incomplete without a beautiful ambience. CRYSTAL crew is equipped with all kind of props of various themes and decorate in the most trendiest way to make your location look glamourous and beautiful. Oh! You have a function coming up and worried of all arrangements??? Reach out to CRYSTAL to make all bookings and arrangements. Not just this, CRYSTAL will let the dreams of your big day turn into reality by organising the whole event the way you want and make them a memorable one.